Bond funds help to pay for new features, equipment in West Linn parks. Projects to get underway as soon as weather allows. West Linn Parks & Recreation is pleased to announce that construction documents have been finalized and pre-construction work will begin at Sahallie Illahee and Sunset parks as soon as weather will allow for grading and demolition of existing structures. Both parks were reimagined with the input of their respective neighborhoods. Sahallie Illahee improvements projected at $90,000 will be funded through the 2018 voter-approved General Obligation Bond and a matching grant from the Oregon Parks and Recreation Department. Replacement of the failing and removed playground equipment was identified as a high priority by staff. Park improvements will consist of better ADA access and a new nature-based playground, and the demolition and re-construction of the Horton Road basketball court. Members of the Rosemont Summit Neighborhood Association have committed to assist with ongoing maintenance of the park by staffing volunteer events, and to assist with the playground equipment installation. Others interested in assisting with the equipment installation are invited to contact the Parks & Recreation office at 503-557-4700 to be added to a contact list. The renovation of Sunset Park consists of redeveloping the entire park, including new ADA pathways, a new restroom, a new playground, new and relocated picnic shelters and an interactive water feature for kids. 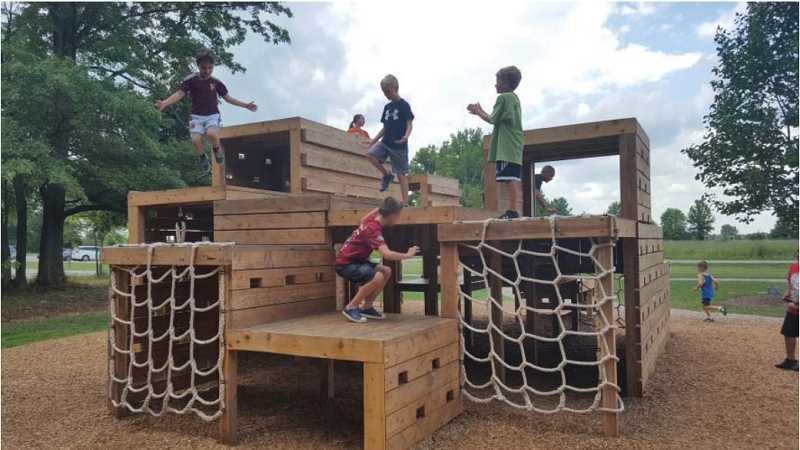 The new play area includes a zip line, a fort-building area and boulder scramble. These improvements are also possible through the 2018 General Obligation Bond. Projected cost for the Sunset Park project is $500,000. Playground renderings and final construction documents are available to review at westlinnoregon.gov/go-bond. Drivers Wanted — Excellent drivers are wanted to transport participants in Adult Community Center programs. A commercial driver's license is not required, although a good driving record and a great attitude are essential. Call Dawn or Tiffany at 503-557-4704 for training details and upcoming trips. Bob Ross Oil Painting March Classes — Judy Stubbs uses a simple, step-by-step method to lead people from blank canvas to completed masterpiece in one class. All supplies provided. Classes are held at the West Linn Adult Community Center, 1180 Rosemont Road. For ages 12+; cost is $58. Paint "Rowboat on the Beach" on March 14 from 5:30-9 p.m., or "Valley of Tranquility" from 10 a.m.-2 p.m. on March 23. Spring Dance — A dance for older teens and adults with a diagnosis of physical or cognitive disabilities will be held from 7-9 p.m. March 22 at the Adult Community Center. Admission is $5 per person, which pays for the deejay and refreshments. No registration required. The Parks & Recreation summer activities guide will be in homes the first week of April. Information on programs offered by West Linn Parks & Recreation can be found at westlinoregon.gov/parksrec. You may register by internet, mail, or drop-off at City Hall (22500 Salamo Road). Call 503-557-4700 for more information. For questions about classes through the Adult Community Center, call 503-557-4704 and speak with Tiffany or Dawn.